The first recipe I baked from this book. It rose well over the top of the bundt pan and then fell which caused the center crust to separate from the cake. I was able to piece it together when removing from pan. I probably over beat the cake in my Kitchen aid, so next time I need to watch the that. Cake was dense, moist with a good cocoa vanilla flavor typical of red velvet cake. I still prefer the classic red velvet with cream cheese icing but this was a good cake. This is good but could use more salt and more vanilla flavoring. This cake turned out so well. It is a buttery pound cake and the bits of coconut and toasted pecans round out the flavor and texture very well. My son said this was one of the best cakes I have made. Phyllis Hoffman is bringing back the pound cake one decadent recipe at a time. Pound cake is proof that something old can be new again. 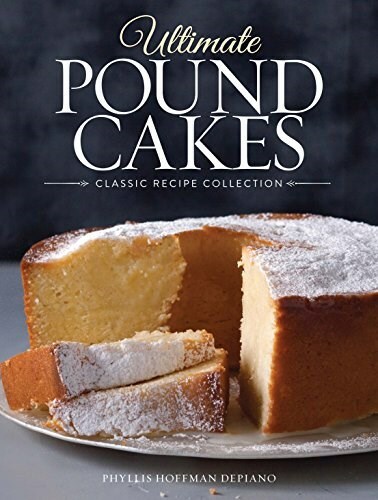 From heirloom recipes to current variations, the Ultimate Pound Cakes: Classic Recipe Collectionof over 85 recipes will give you a treasure trove to choose from for years to come. Holidays, special occasions, or weeknight suppers, these test-kitchen approved, home-baked cakes are always a welcome surprise for family and friends. They also make fabulous gifts. The pound cake, with its original recipe of a pound each of butter, sugar, eggs, and flour, has grown from its early 18th century English origin to a virtual variety of show of flavors with sour cream, chocolate, caramel, and spice to name a few. From tube cakes to mini loaves, this beautiful selection of recipes will enhance your table with delicious desserts for years to come!